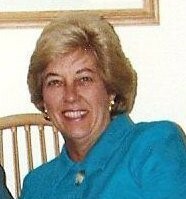 Mary K. Gillis, 82, of Westborough, passed away on Sunday, August 19, 2018 at home. She was the wife of the late Donald M. Gillis. Born in Pittsfield, MA, she was the daughter of the late Angus and Alice (MacAskill) MacDonald. She was raised and educated in Dedham and was a graduate of Dedham High School. She also took classes at Worcester State College. Mary worked as a telephone operator and then a dental assistant before staying home to raise her family. She returned to work in 1978 as a bank teller at Westborough Savings Bank where she worked until 2001. She had been a resident of Westborough since 1962. She was a member of The Congregational Church of Westborough where she formerly served on the Board of Deacons. She enjoyed playing tennis and golf, traveling to Bermuda, and was an avid bridge player. Mary is survived by two children, Todd E. Gillis of Westborough and Elizabeth A. Gillis and her partner, Michael J. Smith, of Millbury, one sister, Joan Winthrop of Dennis, and several nieces and nephews. She was predeceased by a brother, Donald MacDonald. Her Memorial Service will be held on Saturday, August 25, at 10:00 A.M. in The Congregational Church of Westborough, 57 West Main St., Westborough. Burial in Pine Grove Cemetery will be private. There are no calling hours. In lieu of flowers, donations in her memory may be made to the Alzheimer’s Association, 309 Waverley Oaks Rd., Waltham, MA 02452 or at alz.org.